In keeping with tradition, a senior is selected as The Idaho Wrestler's Wrestler of the Year. For a second year in a row, Randles finished the season undefeated as he amassed more than 90-consecutive victories dating back to the middle of his sophomore year. In that span, Randles collected a pair of Tri State titles and three state titles (two in the 4A with Sandpoint and one in the 5A with CDA). In posting a 41-0 record, the future Wyoming Cowboy majored large-school state champions from both Montana and Washington and collected more than 150-takedowns. Shelley High School senior Darrick Stacey is The Idaho Wrestler's Wrestler of the Year. Stacey, who spent his first two years competing for Bonneville High School, captured his third consecutive state title after finishing second as a freshman. Stacey was nothing short of dominating during the course of the 17-18 season, posting a 46-0 record while stapling 37-opponents to the mat. And let there be no mistake, these victories came against quality opponents as Stacey claimed titles at both the Tiger-Grizz and the Rollie Lane. While spending time at both 113 and 120, Stacey claimed wins over state champions from the 3A, 4A and 5A classifications. Congratulations to Darrick Stacey. 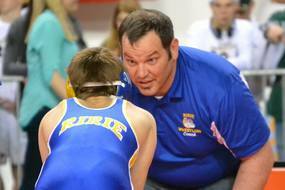 Coach Rob Edelblute of the Lakeland High School Hawks is The Idaho Wrestler's Coach of the Year. Edelblute once again guided the Hawks to a trophy finish--for a fourth time in the past four years. Under Edelblute's tutelage, the Hawks continued to rank among the top dual and tournament teams in the state despite an enrollment of 800-students ranking them as one of the smaller 4A schools in the state. In addition to another runner up finish at the state championships, the Hawks claimed a 4th place finish at the prestigious Rollie Lane as well as a 2nd place finish at the 85-team Sierra Nevada Classic. Congratulations to Coach Edelblute. By season's end, the Wildcats of Columbia had clearly established themselves as the best team in Idaho. From 98 to 285, Coach Cady and company engineered a line up that dominated the 5A field, amassing nearly 60-points more than perennial 5A power Post Falls. ​Twenty-one of Columbia's twenty-four competitors contributed to the Wildcats 276.5-points. The Cats sent 14-competitors to the podium, including a fireworks-worthy 5 for 5 in the championship finals. If the Cats weren't scoring advancement points, they were scoring bonus points as they racked up more than 50-pin points. Unfortunately for the rest of the 5A, it appears the Wildcats have no intentions of going quietly into that good night--championship trophy in hand. While the 5A champs graduate eight state qualifiers, they return nearly 190-state points to the 2017-18 season. At the season's outset, Post Falls' head coach Pete Reardon and Columbia's Todd Cady must have had a feeling that it would come down to this as both teams went out of their way to meet up on the road that has led to this moment. Columbia looked to have the upper-hand earlier in the season when capturing the Sidney Invitational, outdistancing the Trojans by more than 60-points. Ironically a month later at the Rollie Lane the margin was roughly the same--but this time favoring the Trojans. Not surprisingly, the varied results reflect the sort of tournament which each team thrives in. This conclusion, of course, begs the question, Which team does the 5A Idaho State Championship favor? 98-Pounds: Josh Scott, Columbia, may be meeting up with Braxton Mason, Post Falls. The two split earlier in the year with Mason winning by decision and Scott by fall. 132-Pounds: Kekana Fouret, Columbia, the second seed may meet up with Mathias Delarosa, the third seed, in the semi finals. Fouret has a 4-1 advantage--which speaks to his ability to beat Delarosa but few things are more difficult to beat a tough opponent on multiple occasions. 138-Pounds: Second seeded Jason Burchell, Post Falls, may be squaring off against third seeded Kade Grigsby in the semis. Burchell holds a 3-1 advantage here--but these matches have been close--3-1, 3-2, 6-5, and 5-2. Ultimately, however, the nature of the 16-man bracket and the quality of competitors fielding those brackets will determine the outcome of this year's 5A title race. The Idaho Wrestler believes that the Columbia Wildcats with their 6-man advantage will capture the 2017 5A state title by a margin of 35-40 points with the Wildcats scoring roughly 240-points to Post Falls 205. A year removed from a third place finish at the state tournament--130+ points removed from a title--the Minico Spartans have established themselves as the favorites entering the 2017 4A state championships. And for good reason. The Spartans are coming off arguably the school's finest season to date, hammering opponents in duals with a balanced line up and capturing multiple tournaments, striking an effective balance on both sides of the bracket. The Spartans qualified twenty quality competitors, 14 of whom are seeded in the top six. Second to Minico in terms of seeds is the two-time defending champion Caldwell Cougars. As in the past Coach Kloetzer has his Cougars wrestling their best as the bell sounds the championship rounds. Caldwell's bus to the Nampa Center will include a state-best 23-qualifiers, including 11-seeds. Last year's runner up, Lakeland Hawks, will be bringing with them half the town of Rathdrum (the Edelblute family) as no less than four of Lakeland's 17-qualifers carry the last name, including freshman Alex (#2 seed at 98); sophomore Sam (#2 seed at 106); junior Will Edelblute (#2 seed at 113); and senior Brian (#2 seed at 126). And, of course, the three brothers and cousin are coached by their uncle Rob Edelblute. In addition to the four seeds listed, the Hawks have four additional seeds, including defending state champs Larry Johnson and Jared Walker. The Idaho wrestler made a valiant effort to select a different team but the further one digs into the results, the more the Trojans' accomplishments shined. The nationally-ranked Trojans grabbed top honors at both Tri State and Rollie Lane, tournaments that include not your run-of-the-mill fields. State championship teams from both Oregon and Washington stood a distant second to Post Falls at both tournaments. Hermiston and Crook County both dominated their respective classifications in Oregon but fell behind the Trojans by 24- and 36-points respectively at Tri State and Rollie. Kingsbury once again spearheaded a live stream (with commentators!) of the Idaho State Wrestling Championships. Idaho wrestling fans nationwide were able to view the matches of their favorite wrestlers and teams. This access is critical in states such as Idaho where schools travel 500+ miles for the purpose of competing. A year removed from claiming the state title by the slimmest of margins (1/2-point) Harris's Bulldogs returned with a much bigger bite, distancing themselves from runner up Challis by nearly 100-points! Harris guided 12-Bulldogs to the podium (six of whom return next year) to amass 269-points. Its difficult to compare the 2015-16 Leavitt to others, especially co-favorite and fellow 182-pounder Casey Randles, due to a nagging injury that held him out much of the year. Still the West Virginia-bound Leavitt's body of work speaks for itself as the Highland Ram amassed 20-pins in his 21-wins (the other was a technical fall). In claiming his third consecutive state title, Leavitt has established himself as a nationally-ranked competitor. ​​If you were in attendance of the 2016 Idaho High School State Wrestling Championships, you had the honor of watching the state’s best clash in what is regarded as the pinnacle event in the life of a high school wrestler. But like all sporting events, the tournament was not without its controversies. Because its the nature of the state championship beast, fans, coaches, wrestlers, and, yes, even our typically mild mannered referees seem to be a little more on edge than what one might find at regular season events. 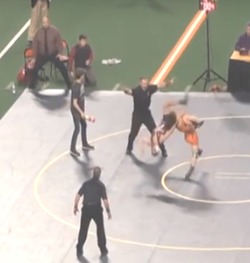 So it should come as no surprise that the tournament’s biggest controversy seemed to draw the attention of every fan and coach in the stadium: The Backflip Heard around Idaho. Minico’s Eddie Daniels and Mountain Home’s Pierce Mederios squared up in the 113-pound 4A state title match, an amazing competition filled with sound but aggressive attacks. The two-time defending state champion Mederios looked to avenge a mid-January loss when he took a 4-3 lead with seconds remaining in the match. The top-seeded Daniels, however, escaped in the waning seconds after executing a stand up and finishing with an impossible-to-follow hip heist, causing onlookers to erupt in an ovation of cheers for both competitors. With regulation ending in a 4-4 tie, one minute was placed on the clock and wrestlers assumed a neutral position. Mederios shot in, snagged the single leg, and elevated it, causing Daniels to balance precariously on one leg. By all appearances, the match looked to be almost over. Mederios swept at Daniel’s post leg at the same time that Daniels executed a back flip, sending the two wrestlers into a wild scramble with Daniels coming out on top, once again, sending the crowd into a frenzy of cheers and applause. Immediately referees declared Daniels the winner—and by all appearances that was the case. Mountain Home coach (and Mederios’ father), however, waved at the head referee, indicating that Daniels’ back flip is an illegal move; consequently, the penalty point and the match should have been awarded to Mederios. After several minutes that included Daniels leaping into his coach’s arms and Mederios (as instructed by his coaches) not leaving the mat, referees officially awarded Daniels the win. The argument, plain and simple, is that Daniels executed (and was rewarded for) an illegal move. The counter-argument (and the claim has been made) is that Daniel’s acrobatic was precipitated by Mederios’s foot sweep. This argument was likely nullified when Daniels himself admitted to it being a back flip. Washington Referee #1: This shouldn’t be a controversy. The move is illegal. Washington Referee #2: Illegal move. Washington Ref #3: This is a clear violation of the flip rule and is precisely why they wrote the rule. The ref’s got it wrong but there is no video replay at the high school level so the appeal is very difficult if the call is missed. That was not a correct call. It was an illegal standing backflip no mistaken. The backflip that was completed in the state finals was [a] little different than the backflip used in the video to clarify the rule. I’m not sure how this wasn’t taken care of in an appropriate manner especially since I heard there is a protest possibility. I could understand the wrong call got away from them if they were a new and/or inexperienced official, but since they had back up with that protest committee it should have been fixed. Of course, discourse should be tempered by two overarching truths: first, errors are simply part of the human condition, especially when it comes to referees in any sport; and second, the argument could be made that the referee in this match may have missed a stalling call that could have given Daniels the win earlier in the match—still that is a judgment call, not something as cut and dry as an illegal maneuver. Ultimately, what we do know for sure is that both wrestlers provided Idaho wrestling fans with a first-rate match, bringing fans out of their collective seats. What’s more impressive is the sheer class demonstrated by both parties. Despite feeling short-changed in the pinnacle of high school matches, Mountain Home coaches argued their case professionally and articulately. As both a father and coach, I am ashamed to admit that I do not believe that I would have been able to show the same sort of class. An important lesson for me and the rest of Idaho’s coaches. Mountain Home’s Pierce Mederios came across as the thoughtful and classy young man that he is. Minico’s Daniels’ celebration was neither over-the-top nor in-your-face--exuberant but likely fitting for something so exhausting and dramatic. The lasting image of the moment, however, might well have been Minico coach Brad Cooper embracing Mederios while he waited on the mat. The Sunday before the state tournament, coaches from all classifications converge on Boise for the purpose of ensuring that their respective athletes are placed in the bracket with a measure of fairness. Coaches from 2A through 4A gather in various rooms at the state athletic association's office while 5A coaches typically meet at Capital High School. In their hands, coaches carry the names of qualifiers from their respective programs, including how those qualifiers faired in each of their matches during the season. "Seedable" wrestlers are typically placed on a board and collectively coaches begin moving through the criteria for the purpose of determining how these wrestlers should be seeded. Non-seedable wrestlers are drawn into the remaining bracket lines. In year's past, accessing opponents' individual match results could prove to be difficult, forcing coaches to linger over the various shoulders of their colleagues, hoping to get a glimpse of who exactly a given wrestler lost to and who they defeated. Technology--more specifically Trackwrestling--has afforded Idaho wrestling fans and coaches a transparency regarding this information. Not only does Trackwrestling afford a window into the results of other programs but to some degree can be programmed to rank/seed a demographic of wrestlers based on specified criteria--but it's not perfect. Out-of-state tournaments, spelling and input errors have all proven to keep the program from being faithful to the criteria. And when it comes to the state championships, coaches, wrestlers, and fans want accuracy and fairness. Ultimately, it is the objective of coaches to be as accurate as possible when it comes to seeding wrestlers in a given weight class. Theoretically the one seed should be the best kid in the bracket--coming into the state tournament. The two seed, the second best; the three seed, the third best… . The driving force behind the seeding is the notion that we do not want the best kids wrestling each other in the early rounds of the tournament. Ideally, the best two kids in the bracket should not meet until the championship round. Evidence suggests that coaches typically do a pretty good job at ensuring that this objective is achieved. Occasionally, however, technicalities can undermine this objective and the "real" championship match takes place in the semi-finals. The seeding is only as good as the criteria that determines it. Idaho high school wrestling relies on three different sets of criteria: 5A, 4A, and 3A/2A each has their own criteria. In fairness, the 2A/3A criteria is similar to the criteria used by the 4A. What distinguishes the 5A criteria is the premium that class places on the previous year's performance at state over common opponent. While all classifications give priority to head-to-head results, the 2A/3A and 4A criteria then gives priority to common opponent where the 5A gives priority to the results of the previous year's state tournament. Critics of "common opponent" claim that how two different wrestlers perform against a given opponent offers little insight into how those two wrestlers would perform against each other. Critics of giving credence to the previous year's results claim that the previous year is too far removed to be an accurate indicator of the present. Ultimately, though, coaches know that 100% accuracy when it comes to seeding is impossible. A bad tournament or ONE bad match during the regular season can undermine a wrestler's seed. And once a wrestler reaches the state tournament, a difficult bracket (see 5A 152-pounds) or, again, a bad match at state can send one of the top seeds into the consolation bracket. Still, overall, seeded wrestlers should place somewhere within a given range of their seed. The #1 should place in the top three. The #2 seed should place in the top 3-4. Regardless of how the accuracy is viewed, the 5A's criteria proved to be the clear winner when it comes to predicting a wrestler's ranking within the bracket--at least as far as the 2014-15 season goes. What might this accuracy be attributed to? The last possible reason, however, would require that results from the past 3-4 years to be analyzed in a similar manner. While no one would characterize this year’s crowned champions as upsets, their respective margins of victory (outside of the 2A) certainly had to raise some eyebrows. In the 5A, the Post Falls Trojans came in favored but not heavily as Bonneville came in with a seasoned line up that included 23-participants. Still the Trojans wrestled like they have all year--tough to end up dominating the 5A field. The 4A race certainly seemed a bit more wide open with Caldwell, Mountain Home and Kuna holding the cards—but that did not last long, either. The Cougars had a fantastic tournament to absolutely overwhelm the field. In the 3A, Snake looked good on paper—but maybe not quite as good as either Sugar or American Falls. Fortunately for the Panthers, kids don’t wrestle on paper. It was in the 2A where fans were treated to a hold-your-breath finish with Ririe leaning into the finish line ahead of New Plymouth by a half of a point! The top four finishers played out their scripts at least as far as brackets go. Going into state, The Idaho Wrestler predicted the top four finishers in the correct order, relying on power-points. Post Falls compensated for their lack of participants, 19 compared to Bonneville’s 23, by way of pin and out-wrestling their seeds. The Trojans secured six more falls than the Bees, translating into an additional 12-points. But the Trojans real (unexpected) points emerged from their unseeded wrestlers. Brad Noesen (+7), Lucas Bolster (+13), and Steven Zettel (+12) contributed 32-points. Bonneville secured a lot of falls but rarely surpassed their seeds—in most cases, however, that fact speaks to the difficulty of the brackets, rather than a poor performance by the Bees. Quite simply, the Trojans had a spectacular year (because of a hard-working and experienced line up) that included a Tri State title and a state title. Did the Cougars have a good weekend? No, they had an amazing weekend. Caldwell entered the tournament with 12-seeded wrestlers. Eleven of those twelve wrestled to or above their seed—the one who didn't was beaten by a teammate who did! The Cougars had an additional two unseeded wrestlers who also placed. Maybe most devastating for the rest of the field was the performance of Caldwell’s first two weight classes; between 98 and 106, the Cougars accumulated a whopping 89-points, averaging just over 22-points/wrestler. Helping the Cougar cause was a field of co-favorites that wrestled to or just under their expected performances. While neither Kuna nor Mountain Home had a particularly bad tournament, they certainly didn't have a good tournament either. Fourth place Lakeland, however, was second only to Caldwell in terms of surpassing expectations. Unseeded Chris Washburn (182) and Bryan Edelblute (113) combined for 31-points, helping the Hawks to a fourth place finish. Unlike their fellow champions, Snake River’s seeds pretty much wrestled to their expected finish, giving a lot of credence to how those kids were seeded. The Panthers did have a few kids surpass expectations, most notably Payson Anderton who finished first after being seeded fifth. Point-wise, such finishes can be profound. When a non-seed finishes sixth, he likely picks up an unexpected 6-8 points. When a fifth or sixth seed advances to the finals, he likely picks up an unexpected 10-12 points. Much like the champions, runner-up Fruitland also pretty much fulfilled paper-point expectations with most wrestlers competing close to their seed. Weiser proved to be the anomaly in the 3A. The Wolverines had three unseeded wrestlers place in the top five, giving them the third largest seed differential in the entire state. Hot on Ririe’s heels was New Plymouth. The Pilgrims’ performance mirrors that of Ririe’s with no real anomalies in terms of finishers. They did have a non-seed finish 6th but also had three seeds finish one position below their expected finish—nothing to out of the ordinary. The Trojans were nothing short of dominating throughout the 2014-15 season, securing the 5A state title by a 66-point margin. Despite the uncertainty heading into the 4A state championships, Kloetzer's Cougars were firing on all cylinders at the 4A state tournament come Friday and Saturday at Holt Arena. Coach K had his kids ready to roll when it mattered most. Owens spearheaded a a much-needed event in Idaho: The Hall of Fame Classic. The Classic proved to be a well-executed event, spotlighting Idaho's hardest working talent.